That is correct, friend! Trevelyan’s Mainframe is back from the dead, no longer just a disappeared feature on the main page of The GoldenEye Dossier. Reports of my death from the desks of the opposition were greatly exaggerated. Janus is alive and well and has been operating in the shadows for the last calendar year. The year 2016 might have been a year of great loss, but it was unable to claim this mainframe or the mind behind it! With no further interruptions and our databases primed and loaded, let us proceed. 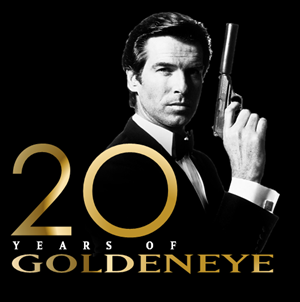 Just in time for the twentieth anniversary for the game rendition of GOLDENEYE for the NINTENDO 64 console? How apropos, no? Now, before getting knee deep into data files allow me to catch you up to speed, old boy, as it has been a while since you logging into the mainframe last. 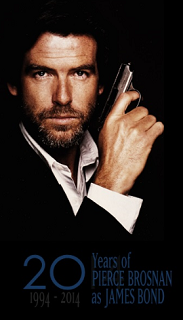 Much to the chagrin of MI6, Janus has been rather busy preparing for this memorial worthy year in GOLDENEYE’s history. 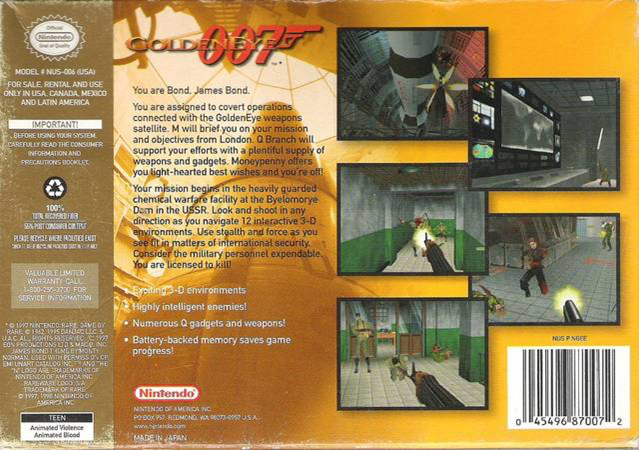 After all, two years following the successful James Bond film sharing the same name was released, a console-based video game tie-in was released on August 25th, 1997. The game would go to become one of the best-selling videogames of all time, even being declared by the Academy of Interactive Arts & Sciences as Console Action Game of the Year, Console Game of the Year, Interactive Title of the Year, and Outstanding Achievement in Software Engineering! But, before we get ahead of ourselves, let’s first compile some of the information on the game’s tricky development and genre-defining features. Taking a look at the back cover of the game’s original box boasts quite a bit, does it not? Out of the things listed, perhaps the most important is the very first. A powerful, detailed, evolving three-dimensional environment wasn’t something the gaming community experienced often, if at all, back in the late nineties. That is, until small, inexperienced team that made up the roster of RAREWARE developers. 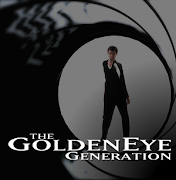 Treated as a small side project by the England-based game development company, the game adaptation of GOLDENEYE was originally imagined to be nothing more than an on-rails shooter, with a predetermined path the main character would travel on through a two-dimensional environment. This would be RARE’s answer to the budding action shooter market just beginning to be really tapped into in a big way on the home console at this time. With limited resources, the small team began to explore other options after considering the vast power NINTENDO’s year-old NINTENDO 64 system offered. Producer Martin Hollis, who originally pitched the side-scrolling design quickly moved away from the idea after only one level was designed in this style. According to what our data inputs suggest here, that original level developed on rails would end up being CHEMICAL WARFARE FACILITY #2, known as simply as FACILITY, or the second level, in the finished version of the game. In fact, developers have stated that that is the only reason the play through path of FACILITY feels slightly linear compared to other levels. Though everything was brought up to speed with that level, it’s original mission path stayed the same. Realizing that this would ultimately not be the style the crew was looking for, inspiration from other popular titles at the time was sought out for. Borrowing some of the shooter physics, gun reloading visuals, and aiming system options from SEGA’s ported version of VIRTUA COP on the SEGA SATURN (a game that was released just a few years prior to GOLDENEYE) and the three-dimensional concept, plus challenging and rewarding level depth from one of the NINTENDO’s launch titles, SUPER MARIO 64, the new vision for GOLDENEYE 007 began to take shape. The game now offered players the ability to choose nearly any path to the finish with semi-open level layouts and a wealth of areas there strictly for the explorer players. Rooms, items, and pickups there for the sake of being there made the game feel far more organic and moving forward, the RARE team decided that each level should be developed with that same sense of player freedom in mind. 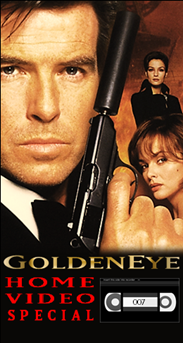 Variety also played a large part in the success of GOLDENEYE 007, so our analysts say. With the changing challenges depending on the difficulty chosen, the unlockable cheats usable once acquired, and having the choice of either wiping out a whole level of guards without being caught or, more often, the endless onslaught of guards arriving when caught… The single player mode became nearly endless! Not to mention the game having a whopping eighteen main levels with two full unlockable bonus levels totaling an impressive twenty! 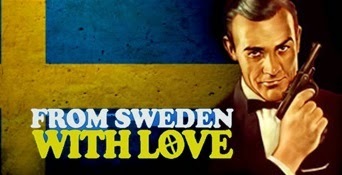 Though, this database would be incomplete if it were to skip over what turned this fun single player experience as James Bond into nothing short of a beloved and respected industry legend. In fact, I’ve always trumpeted that though it may have been the single player that first attracted players, it was in fact the multiplayer that keep them playing. Oddly enough, from what our Janus files here infer, originally, there was to be no multiplayer feature to be implemented in this game! It was merely an add-on for the developers to test weapons, environments, and the way players would react to both. With developers suddenly spending more time enjoying the simple player versus player deathmatches, they added in a few bells and whistles (such as different modes, characters, and weapon settings, etc.) and the rest is history, old boy! 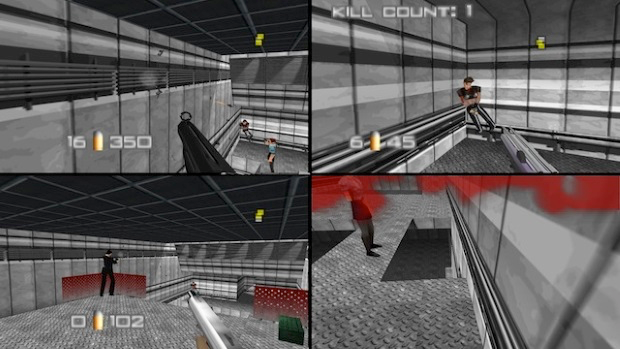 Though it may have tested a few friendships over the past twenty years, there is no denying that GOLDENEYE 007’s multiplayer feature is what it is remembered most fondly by fans. Huddling around television screens, demanding that no one look at their specific player screen, planting traps, and knowing exactly where the body armour was just in case became common practice! To say that it was this version of an action-shooter multiplayer option that paved the way for games for the following twenty years, spawning multiple ways to play against others over the internet or right there on the couch next to one another would be completely fair, in my estimation. I find it still enjoyable over most offers in the genre today, in fact. As far as a basic review of the features, tidbits, and industry standards GOLDENEYE 007 set, that is all we have. Yet, I still feel it necessary that I give you my take on the piece. 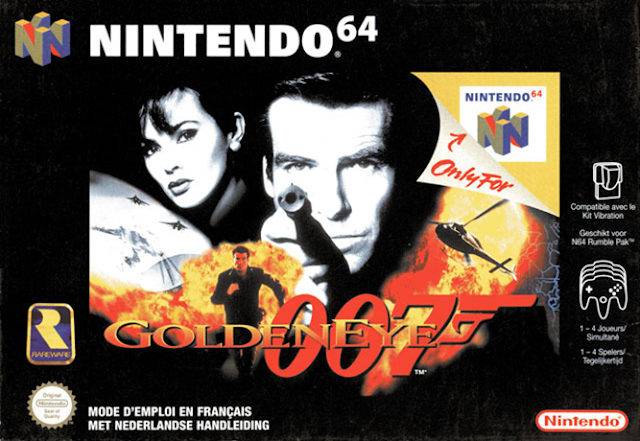 For me, GOLDENEYE 007 was the reason a NINTENDO 64 system ended up on my Christmas list in 1998. My gaming experience started with that game, which is a little bizarre to think about, as it has already been twenty years since the game was released! Every once in a while, it’ll call out to me so I’ll fire up the aged system and give it go just as if it were twenty years ago. As to do this cornerstone of videogame history justice, I’ve already granted you the access codes to further explore each single player level individually, following your read-through of this file. I trust you won’t let such a privilege go to waste. Stand by, as I load up the first collection of data in the lineup, all we have on the Byelomorye Dam. It was the least I could do for a friend.